New York City is a seductive lover who is bound and determined to make sure you don’t get attached. On Saturday, I left my house at 11:00am and got back twelve hours later. Temperatures soared into the 70s. Outdoor bunch turned into pedicures turned into a trip to the flea market (where, naturally, I found the perfect dress) turned into a bike ride turned into a delicious home cooked meal and a boatload of rosé with good friends. Three days later, at the end of a long day of work followed by school, I headed home under a steady rain. The cranky passengers disembarking en masse at Astor Place almost obscured the wads of bloody napkins inexplicably strewn about the wet subway platform. But nothing could mask the sound of the man in yellow leggings and large headphones wailing as he took up an entire row of seats on my car. A strange smell (on which I’d prefer not to dwell) hung in the air. Fifteen minutes and two transfers later, without so much as an announcement, my train went express. Having overshot my stop, I trudged back clutching my heavy bags with fingers that longed for a pair of gloves. I made it upstairs and flicked the radio on just in time to hear the WNYC newscaster blithely announce that we’re under a freeze warning, with lows around 28 overnight. It is April 15th. There are a raft of tasks that I could–in fact, should–be focusing on tonight. Instead, having failed to score a seder invitation for the second night in a row, I set my sights on converting the matzo left over from last night’s salmon into a fancified version of the ultimate Passover comfort food. In keeping with the woe is me theme of this post, the recipe I present is for one. Scale up as you see fit. Melt 1/2 tablespoon of butter in a small nonstick skillet over medium heat. Add the shallot and garlic and sauté for 4 minutes or so until soft. Add the mushrooms, thyme and red pepper flakes along with a pinch of salt. Continue cooking for about ten minutes, during which time the butter will be absorbed by the mushrooms, the mushrooms will release liquid, and the liquid will simmer off. Remove from the heat and stir in the parsley plus a healthy dose of black pepper. Congratulations, you made mushroom duxelles! Now spoon this into a small bowl. Return the pan to the stove, add 1/4 tablespoon of butter, and reduce the heat to medium-low. Crack the eggs into a small bowl, add some salt and pepper, and blend vigorously with a fork. Break the matzo into pieces approximately 1″ square. Place these in a shallow bowl and run hot water over the top. Stir for 30 seconds or so, scoop them out, and add them to your eggs. Pour half of your egg and matzo mixture into the pan. Spread your duxelles in a thin even layer and then top with the remaining egg and matzo. Cook until set and browned on the bottom (7 minutes or so). Flip the matzo brei onto a small plate, add your last 1/4 tablespoon of butter to the pan, and then slide the brei back into the pan. Let cook until that side is also golden brown and turn onto a large plate. I ate this with a simple salad of arugula dressed with olive oil and lemon juice and topped with a little shaved parmesan. I paired it with a beer, which is decidedly not kosher for Passover, but made me feel better about the sad state of affairs. 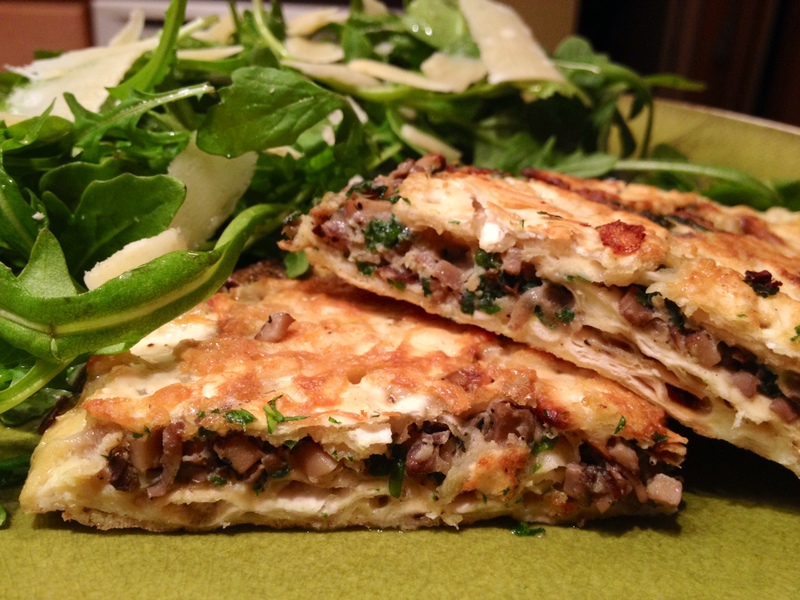 This entry was posted in holidays & occasions, main courses, vegetarian and tagged matzo, mushrooms by Jasmine Nielsen. Bookmark the permalink.